When your laundry first comes out of the dryer, it smells fresh and clean. 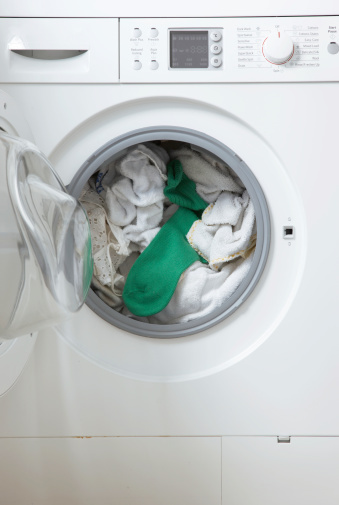 But after a few days -- or weeks -- in a drawer, your clothing may lose some of that laundry-fresh scent. If you want to keep your clothing smelling nice even when it's in storage, add items to the drawers that provide a pleasant scent. Keep your clothes from smelling musty with sachets or drawer liners. Many retailers offer sachets specifically designed to add scent to your drawers. Scents range from simple one-note fragrances, like cedar or lavender, to more complex floral bouquets. For an inexpensive option, make your own drawer sachets by filling a small cotton or muslin drawstring bag with dried herbs or your favorite potpourri. Place the sachet in the back of the drawer, and replace it regularly, when the scent fades. Another option for adding scent to your drawers is using scented drawer liners. Place the perfumed liners, often sold in sets of several sheets, in the bottom of the drawers before you add clothing. Many body care or perfume product manufacturers sell drawer liners in the same scents as their most popular products, so if you use a particular type of soap or body lotion, add that same subtle scent to your clothing as well. For a quick and easy drawer liner, add one or two dryer sheets to the bottom of your drawer. The fresh scent may not last as long as commercial drawer liners, but your clothes will smell nice and it is an inexpensive alternative. Put that collection of pretty scented hand soaps that you'll never use to work making your drawers smell nice. Place heavily scented soaps in the back corner of the drawer; leave the soaps in their wrappers to prevent the soap oils from damaging your clothing. Over time, the soap scent fades, but you can still use the soaps for cleaning after removing them from the drawers. If you want your drawers to stay odor-free, but don't want to add a perfume scent, keep the scent neutral with baking soda or kitty litter. Open a box of baking soda and place it in the back of the drawer; secure it to the back of the drawer with a piece of tape if you're concerned about spills. To use kitty litter, fill a plastic container with unscented cat litter, poke holes in the lid and place the container in the drawer. Both baking soda and kitty litter absorbs any unpleasant odors and keeps the drawers smelling fresh.